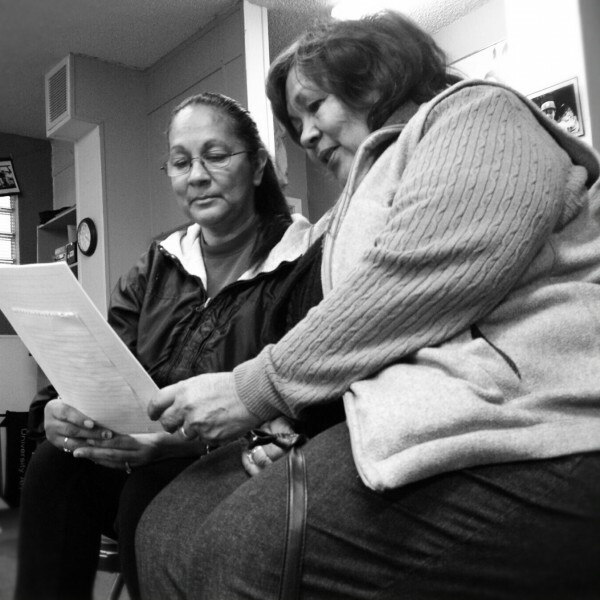 Mary (left) and her mother review paperwork to bring her brother home. Mary came to the first Sunday ACJP meeting after the election with a new look in her eye, and sat with a calm yet ready presence of revitalized hope. Mary’s brother has been in the state prison system for nearly 20 years for a non-violent crime due to the Three Strikes Law. Prior to the passage of Proposition 36, Mary had been attending De-Bug’s ACJP meetings, regularly working with other families to try to find a pathway to bring him home. They explored the appellate process, poured over all of his paperwork, and called attorneys from numerous counties to find some avenue of relief. The odds seemed stacked against them, but Mary and her family maintained a hope in something that transcended the limits of probability, and turned a deaf ear on those who said to just give up. A few months ago, one of ACJP’s lead facilitators, Blanca, started to talk to Mary about a proposition that was going to be on the ballot that could be the vehicle she had been praying for. That proposition, Proposition 36, would allow California voters to amend the Three Strikes Law so that the third offense would have to be a serious violent crime for it to result in a life sentence. And the change would work retroactively, meaning those who had been serving a life sentence due to Three Strikes would be able to get re-sentenced without the limited imposition of a life sentence. In short, some families, like Mary’s, who had been told they would only be able to see their loved ones in prison visits, would be able to bring them home. The California Department of Corrections and Rehabilitation estimates roughly 3,000 current inmates could apply for re-sentencing. In Santa Clara County for example, the CDCR has pre-screened and approximated roughly 150 incarcerated candidates for re-sentencing. While the mechanics of how the involved agencies for re-sentencing – such as the CDRC, County District Attorney Offices, County Public Defender Offices – is still being figured out, families like Mary’s are anxious to get the process started. Santa Clara County, through the Public Defender’s Office, and working in collaboration with the District Attorney’s Office, has been one of the most advanced counties in the state in terms of taking initiative to create the infrastructure for the process. The Public Defender’s Office has designated staff time and resources, met with CDRC and the DA’s Office, even created a pre-screening downloadable form for inmate and families that they have posted on their site. Though Mary’s brother was not convicted out of Santa Clara County, she and her mother went through the form created by the Santa Clara County Public Defender’s Office to understand what information they need to get prepared to apply for his re-sentencing. Just to be holding a piece of paper that in many ways is a map home as it is a legal document, was more that they have had for years to fuel their hope. While Proposition 36 was about needed criminal justice reform, correcting an irrational sentencing scheme, and saving the state much needed resources, it was also about Mary, her brother, their family, and others families like them. They held onto hope for a long time despite it all, and now that hope has been realized through a proposition that is redeeming California, and is re-uniting families.